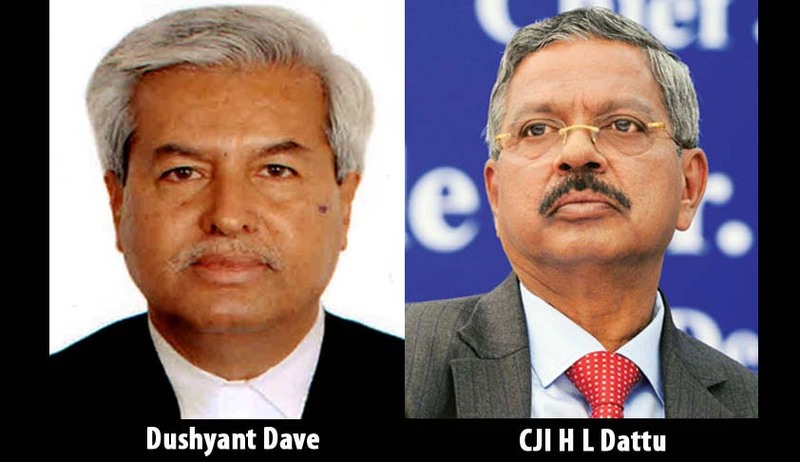 After a strongly worded letter from Supreme Court Bar Association [SCBA] President Dushyant Dave complaining about “sudden and unannounced listing of matters”, to the Chief Justice of India , the Association today decided to convene a Special General Body Meeting on 10th March, 2015 at 4.15. An Extraordinary Emergent Meeting of the Executive Committee of the Supreme Court Bar Association was held today at 1.30 pm, to discuss the situation, arising on account of several developments involving sudden listing of pending matters, and their disposal, by some Benches of the Supreme Court, resulting in grave miscarriage of justice and irreparable damage to litigants and their Cause. The Existing tradition and practice of listing of matters only after publication through Terminal List, Weekly List and Advance List being given a go by and being substituted by sudden and unannounced list, being published on the Supreme Court Website, sometime late in the evening and sometimes even in the morning of the hearing, listing pending and even Admitted Special Leave Petitions (specially criminal matters) for hearings. These sudden listings do not give any time to Members of the Bar, including Advocates-On-Record, to either inform the litigants and their clients about such listing or give sufficient time to prepare their case, it leaves no time for engaging Senior Counsels, if need be, and certainly does not allow them to get necessary instructions, leaving them virtually helpless. This situation therefore, prevents the Members from effectively assisting the Hon’ble Benches, thereby creating a situation of complete helplessness in Just Adjudication of matters. Despite requests by Members to adjourn such matters, some of the Hon’ble Benches decline to do so, forcing the learned Members to argue the matters, virtually with their hands tied behind their back, resulting in unsatisfactory hearing and equally unsatisfactory results. As a result, the biggest sufferer is "Justice” and "Cause" of the litigants, whom the Members have taken oath to represent. This situation is bound to create serious resentment amongst the litigants, since they would feel that they have not been informed or taken into confidence by their Advocates about the hearing and therefore, Judgments rendered in such cases might make them feel that the matters are not argued properly. Such situation will seriously erode the reputation of the Lawyer Members in the minds of public at large and therefore, causes irreparable injury to the Members. Large number of complaints in this regard have been made by Members across the Bar to the President, other office bearers and to the Members of the Executive Committee, over the last few weeks. Indisputably, these happening of sudden listing have taken place without taking the Bar or the elected body into confidence, either by the Registry or by the Hon’ble Chief Justice of India, who is the Administrative Head of the Institution. The SCBA Secretary sent a letter dated 20.02.2015, to the Secretary General of the Supreme Court of India requesting him to do the needful forthwith. This was also followed by a letter sent personally to the Hon’ble Chief Justice of India by the SCBA President, on 20.02.2015. According to the Committee, these requests have been completely ignored, both by the Hon’ble Chief Justice of India and as well as by the Registry and no effort has been made to invite the elected representatives to discuss and resolve the matters, neither have any efforts been made even to acknowledge the aforesaid letters in writing. In the meeting today, the Executive Committee had unanimously resolved to convene an Extraordinary Emergent General Body Meeting of Members of the SCBA to discuss the matter and to pass appropriate resolution and accordingly, the following resolutions are proposed to be considered by the said meeting, for the decision of the General Body. SCBA, while expressing its faith in the Institution of Supreme Court and declaring that its holds Hon’ble Judges in high esteem, requests that its Members must receive in return, the same respect, irrespective of their standing and seniority. SCBA strongly deprecates the recent practice, introduced at the instance of Hon’ble Chief Justice of India by the Registry, listing large number of the matters for hearing, suddenly and without sufficient and clear prior notice, through Terminal List, Weekly List and Advance List, as it believes that this results in denial of justice and causes irreparable injury to litigants and gives grave mental and physical hardships to lawyers, which will ultimately result in erosion of faith in this great Institution. SCBA calls upon the Hon’ble Chief Justice of India to restore the traditional and tried system of listing of matters through an open and transparent mechanism, giving just and sufficient time to the lawyers so as to subserve the Cause of Justice. SCBA disapproves the manner of hearing of matters by some of the Hon’ble Benches, in hurried and selected manner, since it believes that justice should not only be done but must appear to be have been done, should be the guiding principle in the Justice Delivery System and further that qualitative, and not quantitative dispensation of Justice be the guiding factor. SCBA, while placing it appreciation for Registry officials in general, strongly resents and disapproves the rude and unprofessional attitude and conduct of some of the Registry officials in dealing with the members of the Bar and calls upon the Secretary General to ensure that such behaviour is checked at the earliest. SCBA calls up the Hon’ble Chief Justice of India to constitute a joint mechanism, comprising of Hon’ble Judges, Members of the Executive Committee of Supreme Court Bar Association and Registry Officials, to address and monitor mutual issues affecting the administration of Justice to the satisfaction of all concerned.